Slow Cooker Beef Tips and Gravy is perfect to serve to dinner guests but simple enough for a weeknight dinner or appetizer recipe! Serve it over noodles, potatoes or rice! I hope you had a great Christmas holiday! I can’t believe it’s over already and I’m definitely feeling the post-holiday blues. Luckily, we still have New Year’s Eve and New Year’s Day to look forward to enjoying some down time and great food. I won’t be enjoying any adult beverages this year as I’m expecting a precious baby in late spring, but I plan to make up for all of those liquid calories with extra savory food and dessert! I think this Slow Cooker Beef Tips and Gravy would be great choice for New Year’s Eve dinner if you plan on staying in and making something quick and simple that feels fancy. The best thing about this recipe is you can keep it warm in the crock pot all night and you can also even enjoy this as an appetizer! So, what are you plans for the evening on New Year’s Eve? My family and I just got back from an amazing 8 day cruise right before Christmas and I kind of feel like I’m still settling back in. I am just chilling out this week, making some good food, and enjoying the lights from my Christmas tree while I still can. This is my favorite month of the year and I never want it to end! As you can see from the recipes I shared recently for my Cranberry BBQ Cocktail Meatballs (these would also be an excellent choice for a New Year’s Eve appetizer) and my Slow Cooker Italian Pot Roast, I am really enjoying cooking with Moyer beef lately. I love supporting local brands and farmers and from the feedback I get from many of you readers, you feel the same way. My local Tops Friendly Market grocery store always carries Moyer beef in a wide variety of cuts. I do see different cuts available depending on the Tops store I go to, so keep that in mind if you’re looking for something specific as you can call ahead and see if they have that cut available. Good, quality beef is hard to come by and with Moyer I can rest assured that I can always count on the quality to meet my expectations when I purchase it. Moyer beef is available in both USDA Prime and Choice. It gives me a good feeling that buying their beef is helping to support local communities and farmers! Their beef is produced and sourced locally by small family farmers in the Northeast, and shipped fresh to your grocery store. 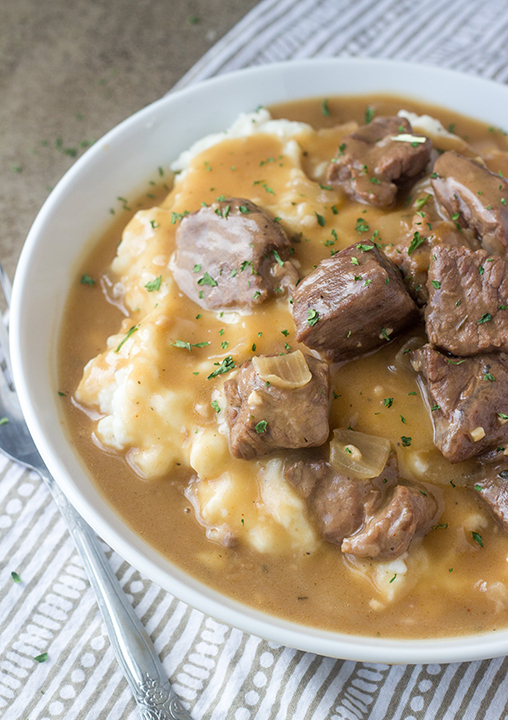 This easy Slow Cooker Beef Tips and Gravy takes such a short amount of time to prepare and then it cooks all by itself! The gravy is absolutely to DIE for. I sent this recipe to a friend a while back and her exact words to me were, “This was such a great recipe! My kids devoured it!” The tender, juicy beef will have everyone coming back for seconds (or thirds) and this will become an instant family favorite. You will also LOVE my most popular slow cooker recipe – this Crock Pot Coca-Cola Roast. We make that roast frequently! 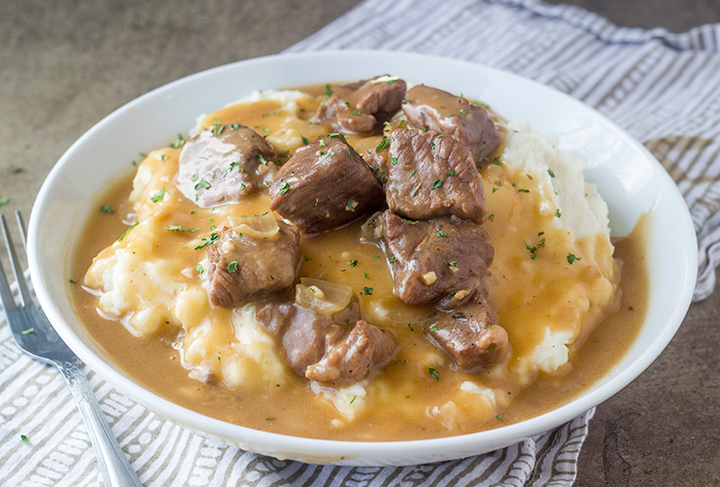 Serve this Slow Cooker Beef Tips and Gravy over egg noodles, mashed potatoes or rice. Add a side of roasted carrots or green beans and you have the perfect meal! 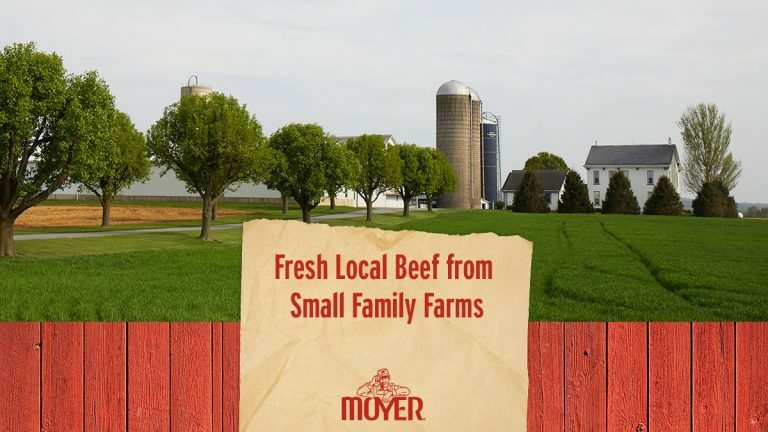 If you would like to find out where the nearest store is that you can purchase some fresh and local Moyer beef, be sure to check out their store locator for more information. 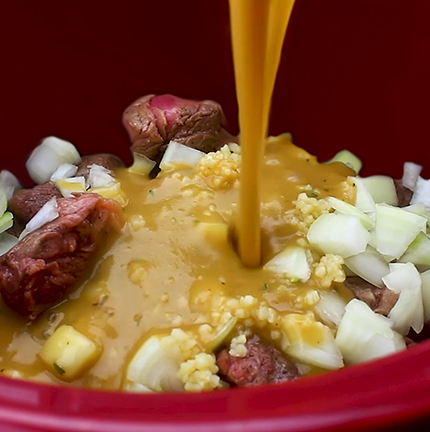 Here is my “how to” video with step-by-step instructions on how to make this Slow Cooker Beef Tips and Gravy! Slow Cooker Beef Tips and Gravy is perfect to serve to dinner guests but simple enough for a weeknight dinner recipe! Serve it over noodles, potatoes or rice! After cutting meat and while it is still on the cutting board, toss it with 1 teaspoon salt and ½ teaspoon pepper. Add beef in single layer (work in 2 batches if needed) to the hot skillet and let cook for approximately 2 minutes, without stirring. Let it cook until it has a nice sear/crust on one side (this will give it a lot of flavor), then continue to cook while stirring until beef is browned all over but not cooked all the way through. Transfer beef to 6-quart slow cooker and top with chopped onions and minced garlic. To the remaining juices left in the skillet, melt 1 tablespoon butter. Whisk in the flour until dissolved. Add in remaining gravy ingredients. Bring this to a boil then reduce to a simmer until thickened to the consistency of thick gravy. Make sure you let it get thick enough because it will thin out a bit in the slow cooker. Add to slow cooker and stir to combine all ingredients. Cook on HIGH for 3-4 hours or on LOW for 5-7 hours. Beef is ready when it is melt-in-your-mouth tender. Add additional salt and pepper, if needed. Garnish with fresh, chopped parsley for color. Serve over OR with mashed potatoes, egg noodles or rice. Enjoy! Disclaimer: Thank you to Moyer Beef for sponsoring this conversation. All opinions remain 100% my own, as always. Thank you for allowing me to share the brands and products I use regularly and love. Next Post » Old-Fashioned Peanut Butter Pancakes + BIG ANNOUNCEMENT! I am seriously salivating right now. This looks SO comforting, especially over a bed of mashed potatoes! Happy New Year! 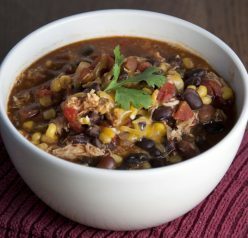 I love crock pot meals – especially on those busy school nights. My family is going to love these beef tips! Love tender beef tips. 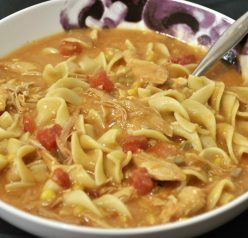 Hearty recipe family will enjoy on cold winter days. I am drooling. This looks SO scrumptious. 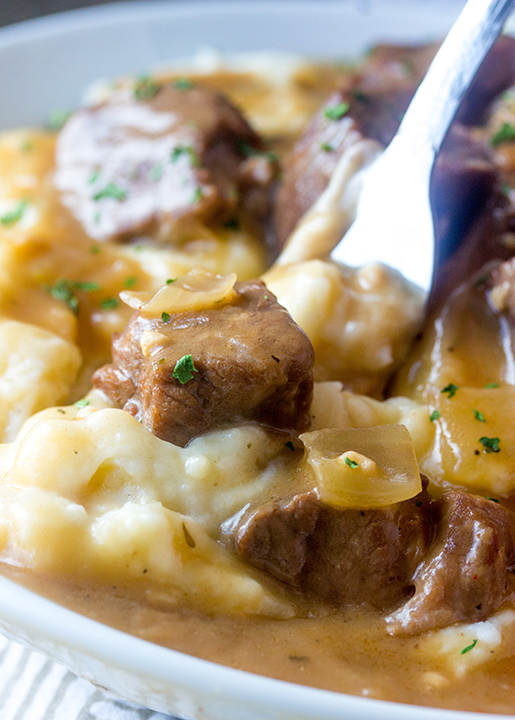 I enjoy beef tips and I love that I can make this in a crock pot. Congrats on your new upcoming baby! These beef tips look devine! I can’t wait to try these over noodles! So I’m not a big gravy person, but beef tips sound amazing. Nice and hearty for winter, too! Hope you had fun on your cruise 🙂 I’ve never been on one but it’s on my bucket list. The meat must come out so tender on this recipe. Love using the slow cooker – really helps out when you’re busy during the day! There is nothing better than a good slow cooker recipe. This one sounds amazingly easy and delicious. It’s perfect comfort food for winter!! This is such a nice hearty meal to serve for company. I’ll have to save your recipe as we are doing some late Christmas celebrations this year. I will have to share this recipe with my mom. She likes trying out new ways of cooking meat/gravy. A cruise sounds amazing. This meal looks delicious, I’ve used the holidays as an excuse not to cook. I need to get back into the groove. This is my kind of comfort foods, I can not wait to put my slow cooker to good use again. I am start with chicken dish then will try this beef and gravy one. This is definitely crock pot season. Well, everyday is practically crockpot season, but it seems as if the best comfort food from the winter season is made in the crockpot. 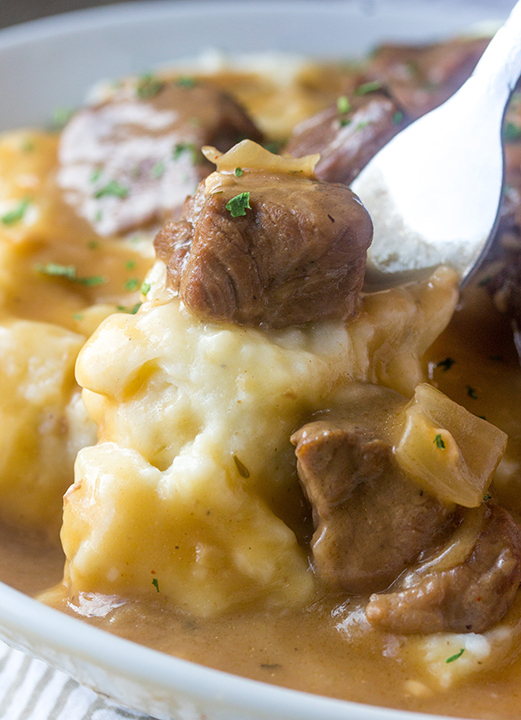 Mash potatoes covered with beef tips sounds like the perfect comfort meal. Wow, this is what I need right now. I am so hungry now after seeing this. This looks delicious! I love that it’s a slow cooker recipe and can’t wait to try it. I think I’ll try it over polenta – yum! My husband would be so happy if I make this. It is something that he would enjoy for a dinner, thanks for the recipe. I am all about slow cooker meals, especially on winter weeknights. It is so wonderful to be able to dump ingredients in, push a button, and then go on with my day until dinnertime rolls around. Can’t wait to try your recipe! Slow Cookers usually give such savory dishes. I have to try this recipe for my family! Thank you for sharing this recipe! Looks really good. I am going to try this one. Best wishes with that new gift that coming your way. What a gift. I enjoy you recipes so much . Thank you again. Lisa…I’m so sorry about that. I made a small edit to the post last night and it made the recipe completely disappear. It’s there now! Thank you! I was able to find it through the recipe source you listed. Happy New Year! Oh I’m so glad! Happy new year! How long do you leave it in the crock pot for? I don’t see any times, even in the recipe box area. Oh my…I’m so sorry. I made a small edit last night and it made the recipe disappear. It’s there now! Oh man is this delicious ?!!! Definitely a new family favorite. I will be making this again and again ????. Thank you for sharing !! This looks AMAZING! I am a big fan of soy sauce however my husband is not. Do you have a suggestion for a substitute? Maybe worchsier? This turned out great! I used three pounds of meat (a little goof on my part! ), but we actually liked how it turned out. in terms of the proportion of meat and gravy. Thank you for sharing the recipe. I’m so glad to hear this!! Thank you for letting me know! Which would be the most tender type of beef to use? 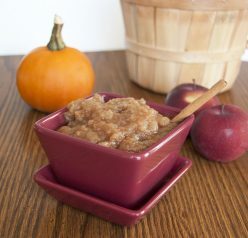 do you have an alternate recipe if not using a slow cooker? I don’t but I’m sure you could make it work on stove top! sorry, that is what i meant – can you help with instruction/times if made on the stovetop instead of slow cooker. My family asks me to make this often- delicious! I always wondered what to do with beef tips at the store. Great recipe! Such a hearty meal! Can’t wait to try it! My family loves this meal. This was a huge hit for dinner! Really delish! So filling and perfect for fall. I love that this is served with mashed potatoes! Made this last night and it was SOOO good! Thanks for sharing such an amazing recipe. I made this last year for Christmas Eve, and am making it again this year. So, so good!! It makes a wonderful main dish for our family. I like to serve appetizers on Christmas Eve, and this is the perfect addition for something more wholesome. My mom had made tenderloin tips years ago for Christmas Eve, when my kids were little, and last year I decided I wanted to carry on the tradition. My kids are grown, and I want them to have the same warm memories that I have. I can’t thank you enough for this recipe. I wish you and your family a very Merry Christmas and a Blessed New Year! Laurie, thank you for the sweet and thoughtful comment! I loved hearing about your family traditions and memories. So special! Merry Christmas!! Is it possible to leave out the bullion? Cooking in the crockpot at this moment. Gonna tear it up! Can I cook the meet and gravy ahead of time? Like the night before? And then cook in crockpot the next morning? A household full of flu, I just put this on (I tasted a piece it taste so good)I can’t wait till it’s done ! Is there a way to turn this into an instapot recipe?